Road Trips: Vol. 2, No. 3 - Wall of Sound (2 CD) by at Public Sounds. SKU: JUL11D04-55767. Hurry! Limited time offer. Offer valid only while supplies last. Celebrating the 35th anniversary of the spectacular Wall of Sound, we invite you on a sonic excursion into back-to-back shows from June of '74. View More In Holiday & Wedding. 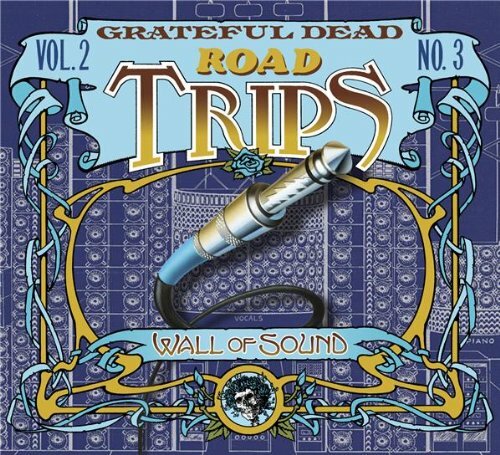 Celebrating the 35th anniversary of the spectacular Wall of Sound, we invite you on a sonic excursion into back-to-back shows from June of '74. Propelled by the heart-thumping power of the Wall, these shows capture the band during a period of heightened intensity and brilliant musicianship. Disc one finds the Wall of Sound towering over the State Fairgrounds in Des Moines, Iowa for a Thursday, June 16th show that's loaded with beautifully inventive jams and inspired transitions. Amazing moments abound, like the 29-minute odyssey of "Playing In The Band" that blissfully dives into space and brings us back again. Disc two picks up two days later at Freedom Hall in Louisville, Kentucky. This legendary setlist includes a brain-melting jam that rolls from "Weather Report Suite" through "It's A Sin." Once again Jeffrey Norman has worked his magic on the soundboard masters so we can experience all this classic Dead in crisp-and-clear HDCD. The set also comes with an essay by Dennis McNally and of course photos of the band - and their mighty Wall of Sound.